John Schyrock Harned began his family tree in 1836, with the help of his uncle. 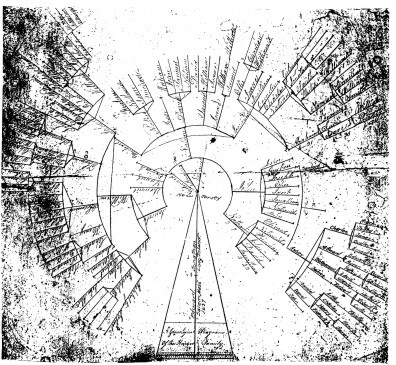 This chart, which he added to over his lifetime, became the basis of all subsequent research on the Harned family. The image above, of a later version, is from a photograph of an original document. At the time we published our book in 1996 we estimated the date of the tree, based on the descendants included, to be "the period 1871 to 1873". Recently, while doing new scans of the photo, I spotted a faint inscription in the lower right corner, which turned out to be "Jany 3rd 1872"...our estimate had been pretty accurate. A few individuals were added at a later date subsequent to the Keith article, including the notations of Edward at Salem, 1637 and Jonathan at Long Island. These changes and the descendants of Reuben and Frank J. were added by Percy Leroy Harned. The original is approximately 11" X 12".